What lies in the darkness between the stars? Why does it become dark at night? How was the universe created, and what happened before the Big Bang? Ulf Danielsson, scientist and fellow human, will provide a cosmic overview of the history of the universe and the dark energy that no one really knows anything about. April 10 will mark the premiere of the second Performance Lecture in which the Nobel Center and Dramaten& − the side programming unit of Stockholm’s Royal Dramatic Theatre (Dramaten) − will convey knowledge by using the tools of theatre. In his Performance Lecture: On the Universe, author and Professor of Theoretical Physics Ulf Danielsson will tell about his research and ask the most fundamental and spine-tingling questions about the magnificent and, above all, dark universe – an existential but scientific lecture that is intended as a reflection on the scale, future and end of humanity. What does a black hole consist of, and how is it formed? Do we live in a multiverse? And what will happen when the last star fades away? It is evolving slowly but is starting to become clearer – our image of the dark, mysterious aspects of the universe. Ulf Danielsson will take his audience to the absolute cutting edge of research, highlighting the everyday world we live in as one part of the greater cosmos. 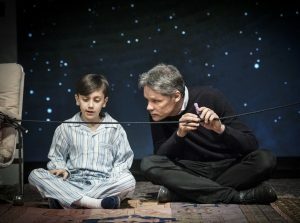 On stage with Professor Danielsson will be John Österlund, a child actor currently in the cast of Dramaten’s production of Roald Dahl’s The Witches. The lecture will take place in Swedish. ”We want to give the audience an insight into the questions faced by researchers – questions that concern us all and that can have a major impact on our society, now or at some time in the future. By working together with Dramaten& we want to awaken curiosity, reflection and a desire to learn more – an ambition that guides the programme activities we are now developing for the future Nobel Center”, says Anna Sjöström Douagi, Programme Director of the Nobel Center. Ulf Danielsson is a professor at the Department of Physics and Astronomy at Uppsala University in Sweden. In addition to his research work he has written four books, lectured, debated and participated in countless television and radio programmes. He is also a member of the Nobel Committee for Physics. Science and stagecraft join forces as the Nobel Center and Dramaten& collaborate in presenting a series of Performance Lectures − a format that conveys knowledge by using the tools of theatre, based on the daily lives of various researchers. It is a new way of exploring and communicating science with the help of stagecraft techniques. Acclaimed robotics researcher and Professor Danica Kragic Jensfelt recently inaugurated the series on stage at Dramaten with Performance Lecture: On robots. The Nobel Center will be a new building in the heart of Stockholm where the Nobel Prize and the fantastic discoveries and contributions for which the Laureates have been rewarded will find their natural venue. The Nobel Prize will provide the basis for broad public activities including exhibitions, school programmes, lectures and discussions about the major issues of our era. The Nobel Center will be a place where committed reformers, curious Stockholm residents, school classes and visiting tourists can meet and be inspired to contribute to a better world. The elegant, timeless building was designed by David Chipperfield Architects Berlin.